"Sampath Speaking" - the thoughts of an Insurer from Thiruvallikkeni: CSK forced to shift home ~ why DD & KX1 missed out 1 foreign player ?? CSK forced to shift home ~ why DD & KX1 missed out 1 foreign player ?? On Sunday, 8th Apr 2018 – Delhi Daredevils played Kings X1 Punjab – and some observed that both teams were short by one foreign player, in specific – Aussies ! ~ the reason ?? Indian opener KL Rahul blasted the IPL's fastest half-century to give Kings XI Punjab a rousing start to their 2018 IPL campaign. Rahul razed the Daredevils attack in a brutal performance, getting to the landmark inside three overs and off just 14 balls. Incongruously, though, Kings XI ended up huffing and puffing to their target of 167. After Rahul's dismissal, Kings XI only managed 103 runs in 84 balls. But such had been the damage inflicted by Rahul that they still ended up winning with seven balls to spare. ~ and on Tuesday at Chennai emotions ran riot. The lead-up to Chennai Super Kings' homecoming after nearly three years was insane. Several local political parties and fringe groups had threatened to disrupt the match against Kolkata Knight Riders to show solidarity with protests calling for the resolution of the Cauvery water dispute between Tamil Nadu and neighboring state Karnataka. Police cordoned off several routes leading to MA Chidambaram Stadium and several roads experienced traffic jams. The standing Umpires were delayed and that resulted in delay of 15 minutes for the toss. Eight overs into the match, though, panic set in when a group of spectators flung a pair of shoes at the edge of the boundary in the vicinity of Ravindra Jadeja and substitute Faf du Plessis. Du Plessis picked up the shoe, smiled at the crowd and tossed it back amid delirious chants of "CSK! CSK! CSK!" The contrasting emotions summed up the night for the CSK faithful. CSK homecoming was celebrated with a fine knock by newbie Sam Billings rising above the chaos. Earlier Andre Russell's brutal 88 not out off 36 balls launched Knight Riders to 202 for 6. In the end, it was another CSK win. Vinaykumar was given a tough task by rookie KKR captain Dinesh Karthik. Having not bowled since the first over of the chase, in which he conceded 16 runs, Vinay was given the responsibility of defending 16 in the final over against Chennai Super Kings. "It's just a game." Kolkata Knight Riders bowler Vinay Kumar took to Twitter to ask people mocking him to ease off. Now comes the sad news for Cricket fan - Chennai Super Kings will lose their home advantage for the rest of the IPL. The IPL has decided to move their six remaining home games out of the city in the wake of protests during the venue's first match and threats to disrupt more fixtures. Kasi Viswananthan, Super Kings' chief executive officer, reportedly met the Chennai police commissioner on Wednesday afternoon and was advised to "reschedule" the matches in the wake of the ongoing protests in the city over the Cauvery river water issue, a long-standing dispute between Tamil Nadu and its neighbouring state Karnataka. "Because of the volatile situation we have been apprised that it is better to reschedule the games," Viswanathan said. "We have conveyed that to the BCCI and awaiting [further] information." It could well be Thiruvananthapuram which would be CSK’s home venue. Super Kings already have experience playing home games away from home; four of their home matches were moved to Ranchi in 2014 due to the dispute between Tamil Nadu Cricket Association and the local municipal corporation. 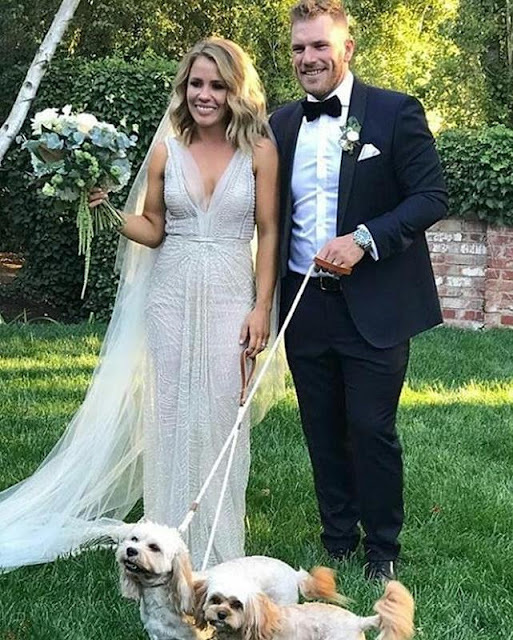 Back to the Q at the start, the annual Australian cricketers' wedding season got underway, with two of the nation’s leading batsmen taking advantage of a brief break in the jam-packed calendar to marry their respective partners over the weekend. Limited-overs star Aaron Finch, who had scheduled his wedding for under the impression the Indian Premier League season would start a week later than it has, married Amy Griffiths at a picturesque venue in country Victoria. Both Finch and close friend Glenn Maxwell, who was emcee of the wedding, missed that IPL side's season-opener when DD played KX1. Away, in Queensland Test No.3 Khawaja, fresh off returning from Australia's tour of South Africa, married Rachel McLellan in the Sunshine Coast.